During her long life Percilla Lauther was known by many names. Originally she was descriptively dubbed ‘the hairy little girl’ and later as ‘the monkey girl’, but she will forever be remembered by those dear to her as Percilla Bejano – loving wife of Emmitt the Alligator-Skinned Man. Percilla Roman was born on April 26 of 1911 in the Puerto Rican town of Bayamon. 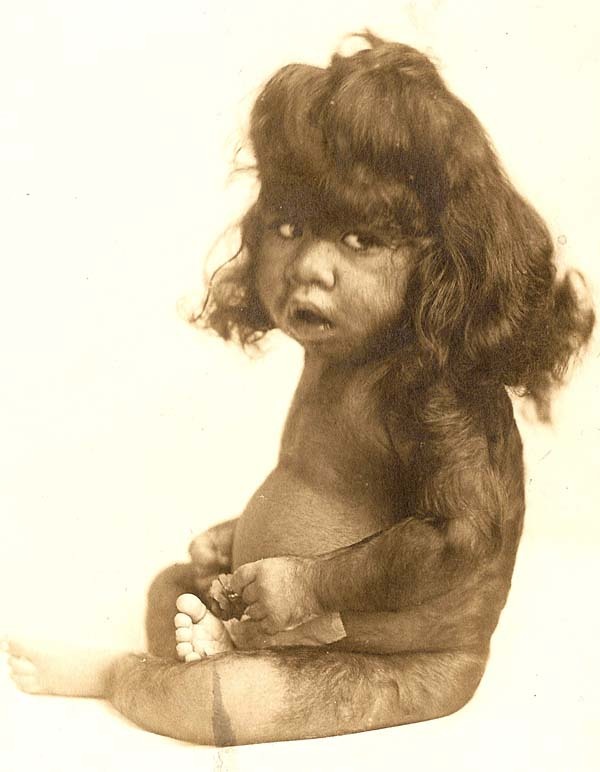 Percilla had been born with hypertrichosis which means she had a full head of dark hair and a layer of coarse dark hair covering her entire face and body. She also had two entire rows of teeth and drew immediate attention from the public and the medical community. Percilla’s father was a native of Spain and he did not know what to make of his daughter initially as she was the only one of the Roman’s seven children born with an abnormality. Percilla’s parents brought her to New York City on several occasions seeking answers from American doctors. Being told that her condition was a genetic abnormality and that there was no cure Percilla’s father developed the idea of exhibiting his daughter for profit. She was only three years old when her father placed her on exhibit. Percilla’s father saw this as an opportunity to make the most of the situation nature had thrust upon his daughter. He approached showman Carl L. Lauther for assistance to help him due to his the language barrier and know how needed to promote Percilla. Lauther was an accomplished promoter and he owned and operated several shows during his lifetime. He took an immediate interest in Percilla and hired her on the spot. Lauther also hired an assistant to help Percilla’s father care for the child after his wife returned to Puerto Rico. That arrangement was short lived however, as Percilla’s father was shot and killed in Gainesville. Upon his death, and according to his final wish, Carl Lauther and his wife adopted young Percilla as his own daughter. Percilla was treated well by Lauther who was a compassionate and loving man. The Lauthers were as much doting parents as they were managers. They hired tutors to ensure Percilla got the best education. (She was already fluent in Spanish and English from living in Puerto Rico.) When Percilla complained of being lonely, they bought her a pet: a trained chimpanzee , Johanna, who would be Percilla’s constant companion, on and off the stage, for years to come. Despite exhibiting Percilla for profit, Lauther was extremely sensitive to the public perception of his adoptive daughter. Lauther disliked the fact that the public took to calling Percilla a ‘monkey girl’ and verbally lashed out at anyone bold enough to call her a ‘freak’. But the ‘Monkey Girl’ moniker stuck and Lauther gave in and began to publicly pair Percilla with a trained chimpanzee named Josephine. He may have had the last laugh, however, as the two attractions were juxtaposed. Percilla would warmly and graciously welcome guests to her exhibit while Josephine would rudely smoke cigarettes and spit. 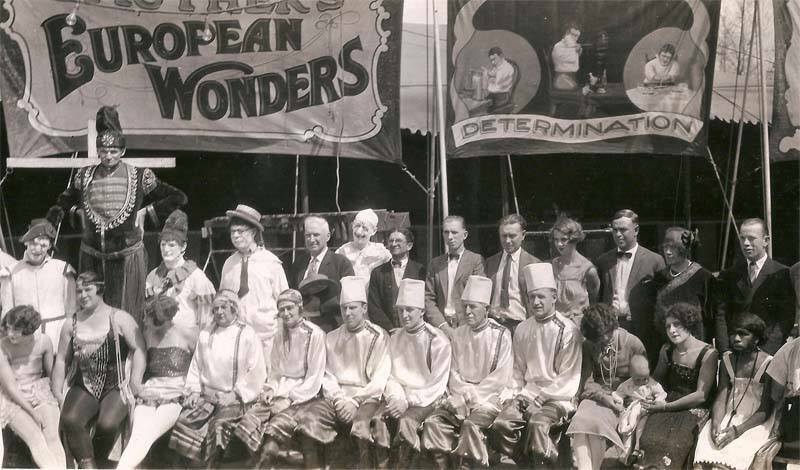 In 1924 Carl Lauther’s, European Wonders Show was one of the star attractions of the Rubin & Cherry Shows midway. Billed as “The Monkey Girl”, Percilla became a great success. She was especially popular with spectators in 1924, in the wake of the famous Scopes “monkey trial” which brought the debate over evolutionary theory into the public eye. Who better to personify the issue than a living, breathing Missing Link? (Krao, G.A. 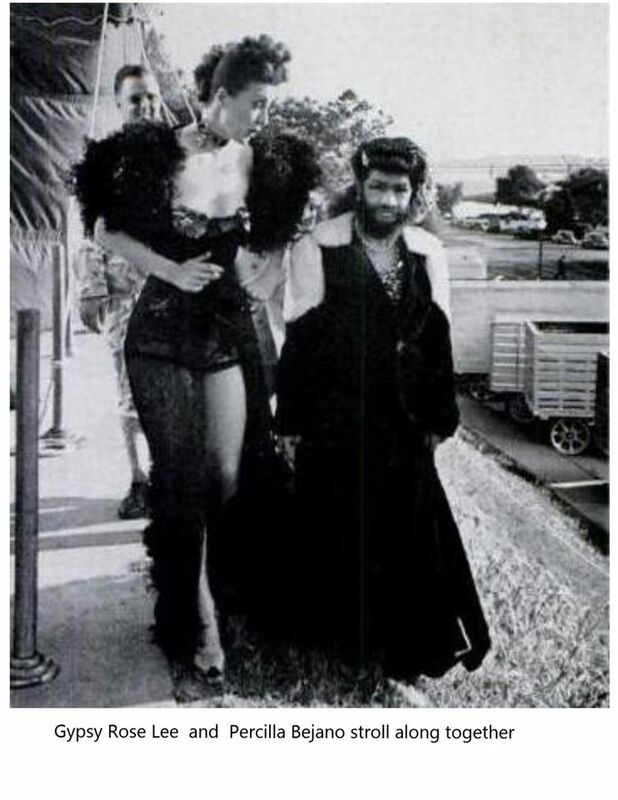 Farini’s “missing link”, was still performing, but had been relegated to the role of a simple Bearded Lady at Coney Island.) Percilla and a trained orangutan, Snooky, even staged a mock debate, with Percilla representing the pro-evolution argument and Snooky standing against it. In the late 1930′s, while performing with the Johnny J. Jones Exposition, Percilla met fellow marvel Emmitt Bejano, the Alligator-Skinned Man. 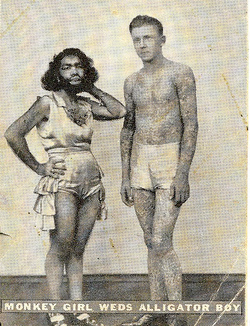 Despite her heavy beard and his ichthyosis a sweet romance blossomed between the unique couple. The pair saw past their physical differences. Emmitt was a man with calloused skin who spent performance intermissions submerged in vats of ice water because he could not sweat. Percilla was elegant, eloquent and possessed an enchanting singing voice. Before long Percilla realized that the gentle Emmitt was the love of her life and the two eloped in 1938. A year later, the couple welcomed a daughter, Francine, into their family. Unfortunately pneumonia took her life after only four months. In 1945 Percilla and Emmitt – as “Londo and Lobello” – left Lauther’s show and signed on with a traveling Ripley’s Believe it or Not exhibit. Among their colleagues were Joan Whisnant Beach, armless guitarist; Clara “Dolly” Regan (then Clara Schazer), the ossified girl; Grace McDaniels, the mule-faced woman; and W.D. “Tiny” Cowan, one of America’s fattest men. Sometime in the 1950s, Emmitt and Percilla bought an acre of land and a mobile home in the carnival community of Gibsonton, Florida. When Emmitt and Percilla returned to exhibition they were promoted as the World’s Strangest Married Couple. Percilla and Emmitt shared the stage and most notably worked for Ringling Brothers and other shows successfully for over a decade. They appeared together in the 1980 film Carny opposite Jodie Foster and Gary Busey. Eventually the couple grew tired of life in the public eye and opted to retire to a private life in Gibsonton, Florida. There the two remained madly in love for many more years. Their union ended with Emmitt’s passing April 17, 1995. In mourning for her husband of nearly sixty years, Percilla began shaving her beard. Percilla carried on, clean shaven for the first time in her life, and briefly appeared in various documentaries and on the Jerry Springer show where she charmed the audience with stories of her beloved Emmitt and by shyly singing his favourite song ‘It’s a Long Way to Tipperary’. Though she continued to make public appearances, she remained beardless until her own death on February 5, 2001.Percilla herself passed away in her sleep. She is dearly missed by all who knew her. Click here to read her Jerry Springer interview. Also watch this short interview with her and Emmitt.